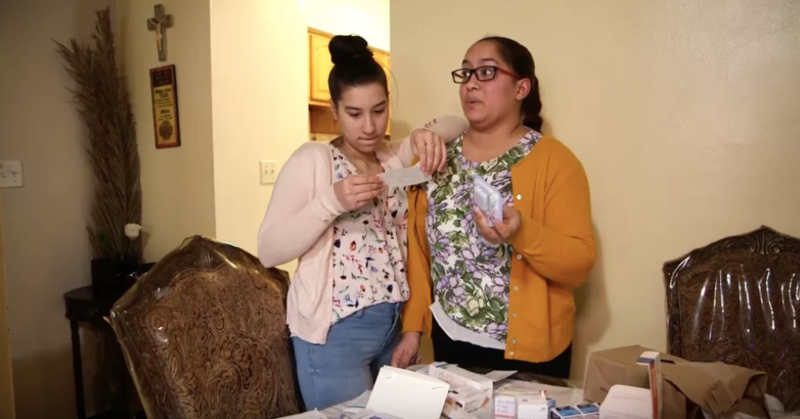 The Norwood News, WFUV Radio, and BronxNet Television present a five-part series on health-related struggles affecting residents of the Bronx. Elbia Cabral of Highbridge knows a lot about insulin. She knows the different kinds of long-acting and short-lasting insulin, the cheap brands, and the pricier brands. It’s been a year and a half since 12-year-old Elizabeth was diagnosed with Type 1 diabetes. And it’s been an adjustment for the whole family. Now, Elbia worries about her daughter’s health and has plenty of questions on her management. “[I]s she going to be doing her insulin herself?” asked Elbia, wondering if her daughter will forget her insulin pen if she goes out with friends. Elizabeth has since gotten used to monitoring her blood sugar and pricking her finger. As an added way of ensuring she stays healthy, the family adopted a diabetes assist dog, Flower, who can smell scents in Elizabeth’s blood sugar. They’ve also had to adjust their lives to afford the insulin and medication Elizabeth needs. At around $1200 a month, or $14,400 a year, her care competes with the price of rent in some neighborhoods. So, the family downsized and cut corners. They moved out of their own apartment into their immediate family’s apartment to save on rent. Elizabeth dropped tennis, piano lessons and cheerleading; she didn’t mind the piano lessons or tennis, but does miss cheerleading. And Elbia perused eBay for cheaper testing strips. “We overused our credit cards in the beginning. That was the only way,” said Elbia. “So we ended up with a lot of debt for something that wasn’t her fault, not our fault, nobody’s fault. But there we were.” Insulin prices have gone up dramatically over the past decade. According to a report from a working group with the American Diabetes Association, insulin prices tripled from 2002 to 2013. And they’ve doubled again since then. Back when Elizabeth was diagnosed, she didn’t have health insurance. The family paid roughly $4000 a month for all of her supplies. Elizabeth has health insurance now, and Elbia said she’s grateful for the coverage. But even with the insurance—covering long- and short-acting insulin, lancets, testing strips, pumps, alcohol, lotions— the price of staying healthy is quite expensive. Elbia said this monthly expenditure has caused the family financial stress. “It’s frustrating. I was at a point where I was like, ‘you know what, I can’t,’” she said. She ended up taking a personal leave from work for three months. The Cabrals aren’t alone. She knows other Bronx parents of diabetics who have to reuse testing strips, or ration their insulin. A report in the Journal of the American Medicine Association Internal Medicine shows as many as one in four with diabetes in the United States have rationed their insulin. Julianne Dimaio says she’s seen diabetics struggle to afford insulin and other medications. She’s the Diabetes Clinical Program Manager for the Institute for Family Health. They have offices throughout New York City and operate Bronx Health REACH, working to combat health disparities in black and Latino communities. Dimaio and her team work to help patients navigate diabetes and managing their health. But she said it can be tricky for patients to get what they need. “There are all these roadblocks for the patient to pick up the insulin, that then the office has to deal with,” she said. “Meanwhile, the poor patient who wants to take the insulin and needs it, can’t get it.” There are serious repercussions for those who do not or cannot take care of their diabetes. Type 2 diabetics who mismanage their treatment in the long-term frequently develop kidney, eyesight, and heart problems. This mismanagement can be the result of inaccessible treatment. One deadly consequence of insufficient insulin in the body is diabetic ketoacidosis, when acid builds up in the bloodstream and the body essentially shuts down. The Bronx has some of the highest rates of diabetes in the country. According to the New York City Department of Health and Mental Hygiene, 16 percent of Bronx residents have been diagnosed with diabetes. Most people with diabetes in the borough have Type 2, which is less insulin dependent but still requires routine maintenance and blood sugar testing. Elbia said navigating health insurance policies makes managing diabetes even more difficult. She argues with representatives on the phone to get more insulin and other supplies because their insurance company underestimates what Elizabeth needs every month. Elizabeth has changed her insulin three different times to keep up with what her insurance company prefers. Some in Washington D.C. are concerned about the rising cost of insulin. The Congressional Diabetes Caucus has suggested a number of legislative actions to improve price transparency and promote competition amongst the producers of insulin. Minnesota filed a lawsuit last year against the three main producers of insulin for “deceptive” price hikes. For now, many people with diabetes struggle to pay for the medication they need. A version of this story also appeared in The Norwood News and on BronxNet Television.